Honeysuckle teepee | What's not to like? With its little cushion, our honeysuckle teepee beckons children to come and sit. Many days there is a child inside, absorbed in a book. I believe childrens’ gardens should have elements of whimsy and beauty that invite little people to crawl in, relax and imagine. 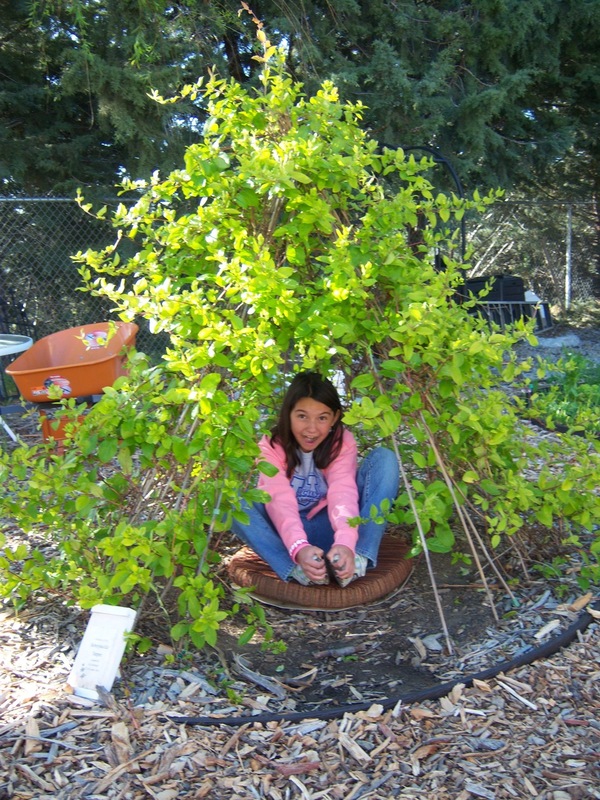 Thank you Heather for creating this beloved teepee in the early days of the garden. This entry was posted in garden and tagged children, education, garden teepee, honeysuckle, reading, school garden, whimsy by kidsingardens. Bookmark the permalink. This is one of my favorite parts of the garden. Whenever kids are out there, someone is in the teepee. I love it!